IF ACTIONS speak louder than words, then integrious actions speak even louder. And even though that strange adjective fell out of favour – and dictionaries – decades ago, it certainly fits the old adage. So as everything around us – not just here but globally – seems to be falling apart, thanks in no small part to corruption and dirty dealings by those who pull the strings, it’s about time we revived the word, reckons The Integrious Project (www.integriousproject.com). One Beau Hodson is behind the push to reintroduce it to the English lexicon. Without it, he says, there’s “a true gap” in the English language. “If we had a word to describe, to name, to call out a person or an act, or even better a self admission, we would become more aware of what integrity is, and what it means to us,” says Beau. The cause – which even has its own Facebook page – is, he says, “about more than just the word, it is about connecting with and stimulating people to think about what personal integrity means on a broad scale and how it can be applied to our lives”. “It is time for integrity to make a comeback and it is time we start taking integrity personally. 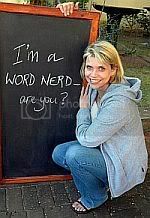 This entry was posted by stevieg on Sunday, April 24th, 2011	at 12:21 pm	and is filed under A Passion for Words, General	. You can follow any responses to this entry through the RSS 2.0	feed. You can leave a response, or trackback from your own site. I like your blog, and look forward to future posts! Keep up the great work.